I love Steampunk, and Lilly B Haven is the person to get with. I have several of her pieces. Slick, you know better than to question something on the forum. All I can say is Bring it On, not sure why a B-Western shooter would even care at this point. 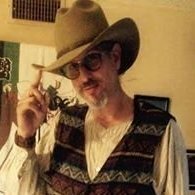 Couldn't Steampunk just be a "B Western" classification? Oh bloody damn wonderful. I think I'll stuff cotton in my ears and go back to bed for the rest of the day. But seriously, I believe that there are already more than enough categories, you don't need another costume category to segregate the Steampunk shooters in. They can shoot in one of the 52 current age-based or shooting style categories that we have now. Heck, done right, they might even be able to qualify in B-Western and/or Classic Cowboy. However, Steampunk might be a nice addition to the categories for costume contests. Match directors, you could even offer the costume category without it being included in the costume contest rule book! Boy, talk about "Thread drift". I never said anything about a new category. I plan on just being a "Cowboy" or a "49'er". I just wanted to "Steampunk it up" a little... or a LOT. Good idea!! then the cherry pickers have another catagory to pick from.. 2--10 more awards at the awards to endure . Don't forget that denim should/will be allowed,,,, booties, logo's on shirts.... no/yes hat,,, rolled up/short sleeved,, or not,,, allowed,,,,,don't worry about 'click' on first shot from pistol(s). The thing I want to work on when I get back stateside's is to take a few BP Colts, probably '51's, and a shotgun and rifle and braze on some Steampunk tubes and muzzle blunderbuss fittings, and doo-dad's to make them look Steampunk but still functional. There should be a way to do it, just need to ponder it a bit more before I take to the torch! I can safely say that it would never occur to me to do otherwise . . . but I'll re-read them before I cut metal! I never even heard the word "steampunk" till about a year ago & didn't have a clue to what it was. I now think of it as dude, or city slicker attire. Contrary to what the westerns channel calls it a "dude" referred to somebody from back east and completely unaware of western dress & customs. Remember in some westerns the "dude" getting off the stage or train and the local cowboys would start laughing at him & hoorawing him, maybe making him dance by shooting at his feet? I'm still undecided about the SASS Steampunk connection. But I absolutely DO NOT WANT non-authentic looking (unheard of, wierd-looking) weapons used in our matches. Hell, when I was a kid I watched the Wild Wild West every chance I got. I kind of categorized it as a TV Western, while knowing their gimmicks were really just bull shi*. PS I liked it so much I named my gun shop Wild West Arms. Not even one of these: http://www.drgrordborts.com/products/the-righteous-bison-indivisible-particle-smasher/ ?? But I reckon the Henry Big Boy is weird enough for me. I'm actually surprised that no one has said anything about my Rugers with RED WHITE & Blue grips. The movie Dead Man has about the best I have seen, pretty dark movie but the dress is good. Got nothing aginst it. Slick, I got your back brother. We've had several couples show up at monthlies dressed "Steampunk". They put a lot of effort into their outfits and really looked good. Not sure just what it had to do with "Cowboy" though. Then again this is a "Fantasy Game". Isn't it? One of our shooters put together a steampunk styled outfit this year. The winged ornament on his lapel is a winged pin he picked up somewhere that has a small clock work or mechanical watch as the center piece. 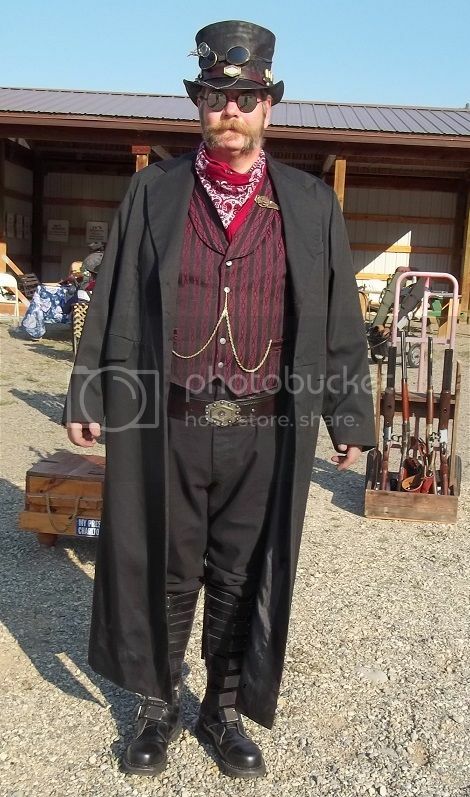 Rivets on the belt buckle, magnifier glasses, leather top hat with a couple tiny bottles of mercury and "gold dust" tucked into the hatband as well as a few cartridges, mirrored safety glasses, etc. I don't know where he came up with the boots, but they're perfect for the outfit. Boy oh boy, between the costume police and the naysayers (not to mention the Tex bashing) no wonder people stay away from the Wire! C'mon guys, learn to be just a little tolerant, ok? Just because it ain't 'cowboy' don't mean it ain't SASS!!! There were townies, shopkeepers, railroad men, soiled doves...the list goes on and on. I have seen some truly WONDERFUL outfits of the military 1800's early 1900's genre and those certainly aren't cowboy so get a grip, ok? Artemis Gordon, steampunk meets Mr. Spock....I mean after all, who says there weren't Vulcans in the 1800's??? My opinion as well. Yea it may be cool and fun but, somehow I don't think a cowboy match is the place to look like a cartoon character. Chitty Chitty Bang Bang we go. I have a basic revulsion with anything having to do with "punks" and simply find it hard to visualize punks in SASS. Remember Dirty Harry? "Do you feel lucky, punk?" The picture in Post #40 looks more like an ad for a Holloween costume store rather than suitable SASS attire. But, live and learn. Once we get to baggy shorts, wearing baseball hats backwards and shooting our guns sideways we may have to come up with a new name for SASS and might have to add a few new categories. The only think new about this is the name, "Steampunk". The late 19th century science fiction writers like Jules Vern, H.G. Wells, and even Sir Arthur Conan Doyle of Sherlock Holmes fame had illustrators that depicted this Victorian era look and there have been devotees even then that emulated the style. it may not be cowboy but it certainly is 1800's in origin. I have seen a handful of references to Steam Punk originally referring alternately to the "Whistle Punk" or the "Donkey Puncher/Donkey Punk" in early logging operations. The Donkey Puncher was the man who tended the steam donkey, which was the small skid mounted steam engine used to pull felled logs to the yard. The Whistle Punk normally was a younger boy who was stationed in a spot close to where the trees were felled and after the log was secured and ready to skid, pulled on a long lanyard rigged to a steam whistle that let the Donkey Puncher know it was ready to be skidded to the yard. How the word came to describe steam-era science fiction, I don't know, and perhaps there is no connection at all. Once we get to baggy shorts, wearing baseball hats backwards and shooting our guns sideways we may have to come up with a new name for SASS and might have to add a few new categories. Perhaps H.A.S.S for a new name? Enjoy - Viva la difference . . . . I for one can't wait to see pictures!!! Question? Was the hat Billy was wearing in the famous "left handed gun" tintype considered Steampunk ? Could be - if the rest of the outfit was . . or if it was dressed up a bit - perhaps with a set of aviators goggles, or some appropriate steamtype brass sparklies . . .
an easily pigeon holed style, there are at least six major groupings of costume style, and degrees of involvement in the art form. There are Military types, Aeronaut sky pilot (and pirate) types, post apocalyptic cowboy types (see firefly), mad scientist/ monster hunter types, and a few more as well . . . It's as open as the whole Hollywood cowboy thing we have here is SASS.